THE RIDGEWOOD VILLAGE COUNCIL’S PUBLIC WORKSHOP AGENDA JANUARY 10, 2018 7:30 P.M.
Last night was unfortunately yet another example of how our local government is conducting business. The misinformation regarding the presentation of this parking garage is in glaring view. For such a massive project that is going to cost us millions of dollars, why can’t we get a proper view of how this proposed garage is really going to look? Why isn’t there a 3D rendering, both virtual as well as a physical model built of the garage as well as the other buildings, so that we can truly understand what is being proposed? Why is the proposed garage still not residing inside of the municipal lot footprint? Why does the “Plan D” proposal that the Village Council voted in favor of on January 27th now have only one lane of vehicular travel, when for that vote there were two driving lanes? Lastly, the treatment of Councilwoman Knudsen by other members of our government as well as the architectural firm was beyond reproach. Her concerns were dismissed by Commissioner Parillo – as was her vote. This is not how we treat a Councilwoman or anyone for that matter. Once again, we as residents are faced with difficult choices. Many of us want a garage, but this is not how to do it. On March 23rd, the Village Council will be voting on this proposed garage as well as the high density housing issue. I strongly encourage you to mark your calendars for that evening and to share your concerns with our Village Council and members of the Historic Preservation Commission in the meantime. There is so much that can be done with improving our wonderful village, but let’s do it right and with care. 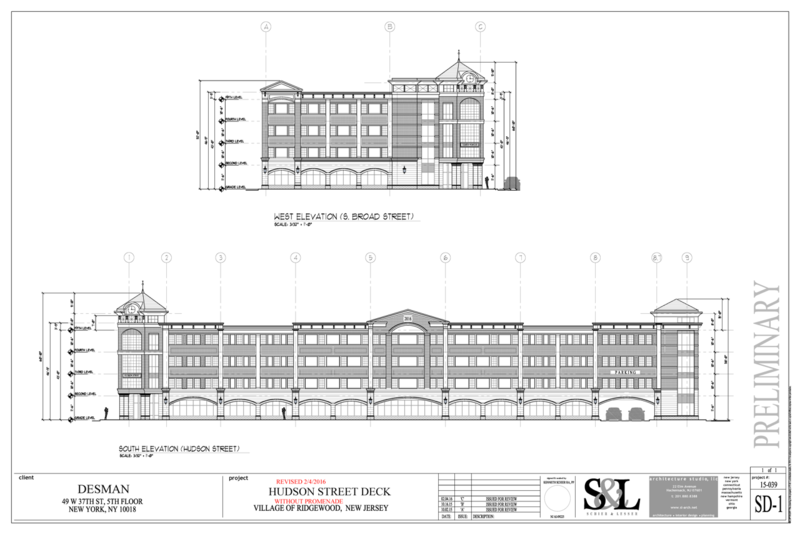 Ridgewood NJ, Get up to speed on the latest details released from the Village on the proposed parking garage on Hudson Street. This document produced by BCIA Professionals contrasts BCIA County Guaranteed Financing with Village of Ridgewood Stand Alone Financing for debt associated with the Parking Deck Project. Please note that the estimated differential between the two scenarios has changed since last week, due to changes in BCIA issuance costs amended by the BCIA on Friday, January 29, 2016. Now, there is an estimated differential of $22,248 which averages less than $900 per year. Click Here for the document. Ridgwood NJ, The Ridgewood Knights of Columbus is the next stop on the signature drive . The Petition seeks to protest and repeal Ordinance 3519,authorizing the execution and granting of a lease purchase agreement until it can be voted on by registered residents of Ridgewood with the Bergen County Improvement Authority (BCIA),as a binding referendum question. The Ridgewood Knights of Columbus will be open on Thursday from 7:00-10:00pm for those interested in signing the petition. K of C hall is on the corner of Hudson/S. Broad St. To enter the hall, you need to use outdoor staircase facing Hudson Street www.no2bcia.com right across for the proposed parking garage . According to No 2 BCIA petition signatures are still being collected They ask you to please reach out to come and sign or visit the website for more locations and information. 201-675-8937. Anne Loving, call cell 201-723-8017 to make appt to sign. Saurabh Dani, call/text cell 973-903-5361 and I will stop by to collect your signature. Ridgewood Nj, The people are taking back the town. No2BCIA ( http://www.no2bcia.com/ ) is on a roll. Keep the signatures coming, we need each and every one. This is a chance to save Ridgewood from a huge financial mistake. We will be able to bond in-town when all is said and done, we will not have a big fat county garage in the middle of town, and we will have full domain over the structure. Several reports came in that the mayor was reportedly observed looking at the Elks Club building while standing in a nearby parking lot talking on his cell phone. Ellen McNamara: 120 West Ridgewood Ave, text 201-874-0966 to let her know you’re coming by. Friday after 11am. now also including the looming possibility that polygamy will be the next hot-button issue. delightful; for our friends in all parts of the earth. us to bear cheerfully the forgetfulness of others. loyal and loving, one to another. mercy for Christ’s sake. Amen. you for all of you who make this parish a real family. believe the bond issue would be for an amount that is needed for that design. independent consultant to review the Traffic Impact Study prepared for the Village. garage as it fits into adjacent buildings and from different perspectives. It is very helpful in understanding the project. It is important that we hear from you before January 6, 2016, when the Village Council will take up the Bond Issue again. The Financial Advisory Committee (the “FAC”) of the Village of Ridgewood strongly supports the proposal to construct a parking garage at the site of the existing Hudson Street parking lot. Members of the FAC have carefully reviewed the proposal, including discussions with Village management and a thorough review of the financial analysis prepared by Walker Parking Consultants (the “Walker Study”). Based on that review, we believe it is in the best interests of the Village to move forward with the project. We would like to highlight the following points: The Walker Study substantiates the long-held belief of many of our residents that there is insufficient parking to adequately serve the Village core. While there is ample anecdotal evidence that parking is difficult in downtown Ridgewood, the Walker Study provides factual confirmation based on observations of parking usage at different times and days of the week. We believe the methodology used in the Walker Study is reasonable and its findings accurate. While there is excess capacity in parts of the Village, parking demand in the central core exceeds practical supply at nearly every key time of the day. As set forth in the Walker Study, the costs of the parking garage can be supported entirely by Village parking revenues, assuming small increases in parking rates and the extension of metered hours to 9 p.m. The FAC conducted its own independent analysis of the costs and revenues associated with the proposed parking garage. Using very conservative assumptions (no new revenues, construction costs as high as $14 million and interest rates as high as 4%) the garage can still be funded entirely by parking revenues. A new parking garage will have a significant positive economic impact on the Village. The new parking garage will enhance the attractiveness of existing stores and restaurants, encourage new businesses owners to choose Ridgewood, and modernize our parking infrastructure. Parking has been an issue in Ridgewood for decades. Finally, we have an opportunity to address the parking problem, and thereby safeguard Ridgewood’s appeal as a destination for dining and shopping, and preserve the vibrancy of our central business district. The FAC encourages you to vote “YES” for parking on November 3. Two important forums scheduled in Village Hall – 4th Floor Court Room – to discuss the proposed Hudson Street Parking Deck: Wednesday, October 21 and Monday, November 2 from 7:30pm to 9:30pm. Village professionals as well as the design team from Desman Associates will be on hand to discuss all aspects of the proposed parking deck, including the design and financials. All are welcome to attend. All questions are welcome! Resolution 15-303 : Desman, Inc.
Two important forums scheduled in Village Hall – 4th Floor Court Room – to discuss the proposed Hudson Street Parking Deck: Wednesday, October 21 and Monday, November 2 from 7:30pm to 9:30pm. Village professionals as well as the design team from Desmond Associates will be on hand to discuss all aspects of the proposed parking deck, including the design and financials. All are welcome to attend. All questions are welcome!